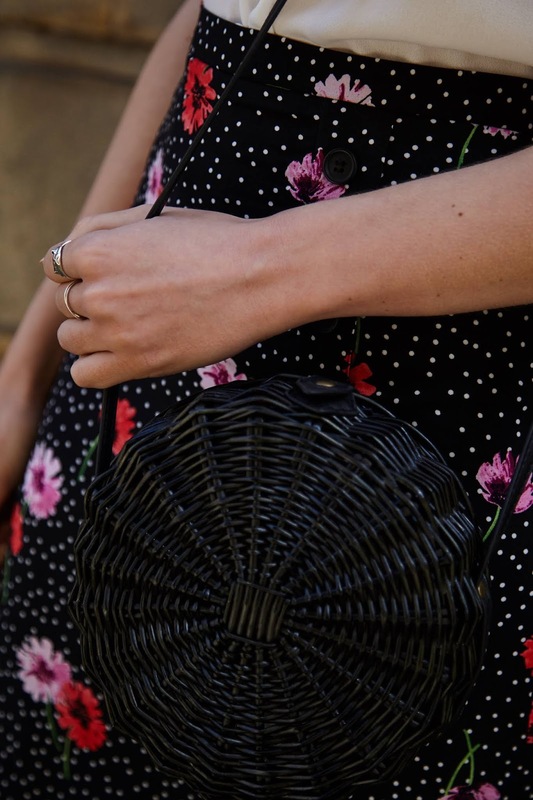 One of my top essentials for summer accessories is of course the basket bag... I say of course because you guys have seen my sporting the woven bag repeatedly, without fail every summer! 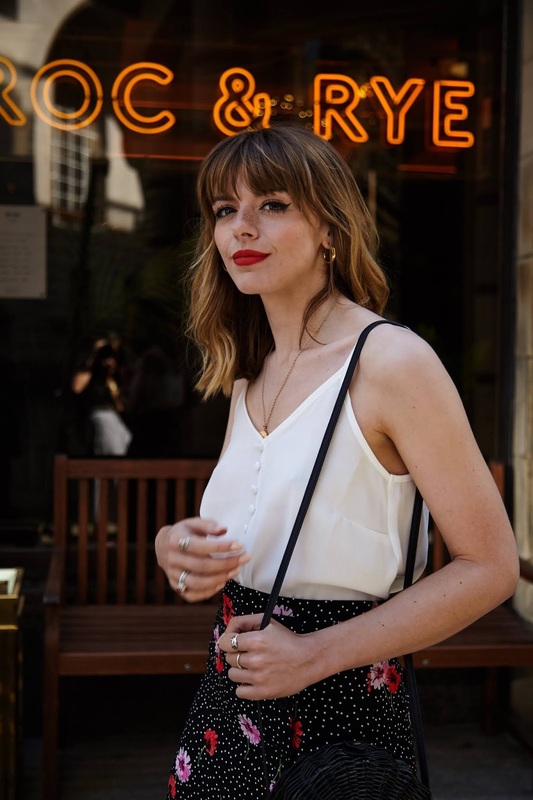 It's probably one of the best example of transitional summer pieces from day into evening because as casual as it can be, there's also something effortlessly chic about a compact basket bag casually draped over your arm. I'm particularly in love with this Circular Woven Bag from Very! The black colouring is a welcome change from classic natural tones and transforms this style of bag into something a touch more dressy. Furthermore the small, boxy shape makes it easily wearable with any evening outfit without looking to bulky or fussy. 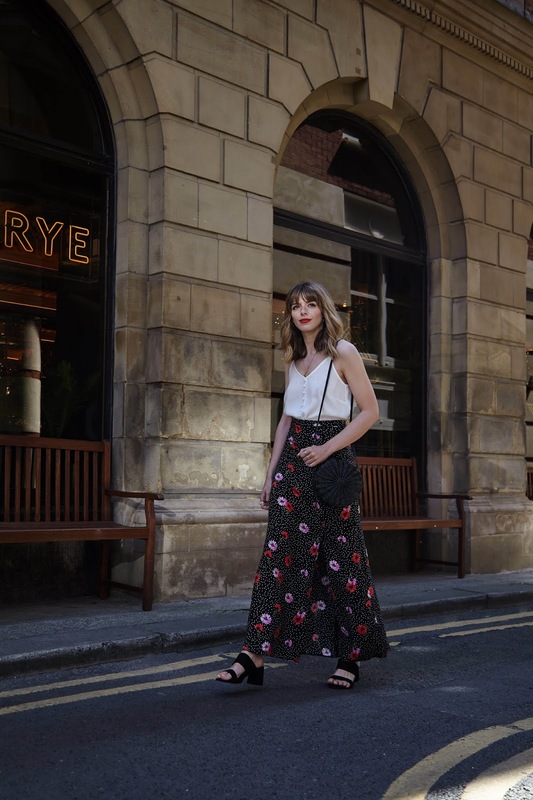 I've styled mine in this post as part of a perfect day to night look with my dark ground maxi skirt from Very. 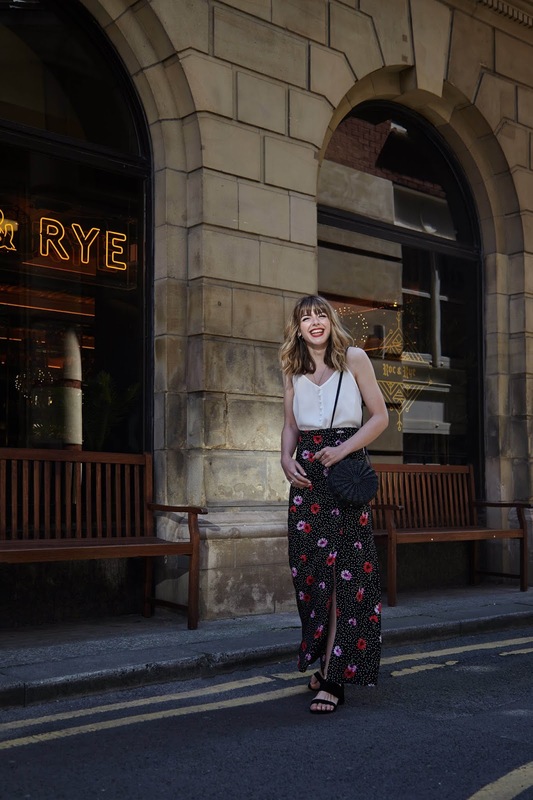 I love the print on this maxi skirt because just like my dinky basket handbag, the dark ground makes it even more easy to style from day into evening. Polka dot is always a great pattern for a classic, timeless outfit you can pull out year after year, but the additional floral design just gives it that seasonal touch and is a match made in heaven with a red lip for that dramatic nighttime feel! I should also had that I'm a big fan on maxi/midi shapes this year purely for the simple fact they are super flattering and ridiculously comfy, ideal when you're planning on wearing it from dusk until dawn (kind of... I'm normally in bed by ten at the very latest, not going to lie). Lastly I've teamed my maxi skirt with a good old faithful of mine, the loose camisole (my button down, cream number is available from Very now). Now I've spoken about the cami before and just how great this piece is over summer so I won't ramble on it too much again BUT what I will stress is it's definitely worth investing in! And I'm not using the word "invest" lightly here, the cami is a wardrobe staple and so versatile for pretty much all occasions. Worn over a tee you've got a perfect casual look, but on it's own it makes an ideal evening piece. You can read my full blog post on how to style the cami HERE. You may have already spotted Very's dinky circular bag on my Instagram recently, worn with a much more "daytime" appropriate outfit, only furthering my point about how eclectic a basket bag can be! This woven style is synonymous with care free, "French girl" style (see Jane Birkin for further details) and is the perfect accessory for "undone", chic dressing which should last you a lifetime. I adore wearing my little bag over dungarees and a gingham blouse for a quick Sunday look (no make up necessary)! Or if I'm meeting friends for lunch, with a dainty floral sun dress (I recently featured my basket bag on Instagram with a Very blush toned frill dress) and my favourite comfy sandals as more feminine outfit. All that's left to do is simply add a classic pair of shades to effortlessly achieved timeless French style we all know and love. Tres Bien! Dressing for summer doesn't have to be about continually buying new pieces year after year. It's about carefully selecting pieces which can last you a lifetime or a least from Morning until Midnight! This year (and next) my Very Woven bag is not only carrying my handbag essentials but it's carrying me right through the summer months too.